Children should be playing more computer games in school. That idea might enrage you if you think kids today already spend too much time staring at screens or if you are already sick of your offspring’s incessant prattling about fighting zombies and the like. But hear me out. Specifically, I think more children should be playing the online game Minecraft. Minecraft is like a digital version of Lego in which players can construct everything from simple houses to intricate fantasy cathedrals and even complex machines such as mechanical computers. There is no intrinsic aim to the game. Like all good ways of sparking a child’s imagination, it requires them to set their own goals. But Minecraft is much more than just a game. Used carefully it can also be a powerful educational tool. It allows young people to create and explore places that are completely inaccessible by other means. Within the blocky world, they can roam around historical sites, delve into the geology beneath their feet or fly through the chambers of a heart, and much more besides. The rich resources of these virtual worlds, coupled with the educational version of the game, allow teachers to immerse young people in a comfortable but exciting learning environment. Minecraft has the ability to bring just about any conceivable structure to the classroom, bedroom or sofa of every player. One of the types of structure I’m particularly passionate is that of proteins. These tiny molecular machines fascinate me. They control just about every biological process in your cells and knit your body together. From replicating your DNA and forming the bases of your skin, hair and connective tissue, to digesting food, fighting infections and transporting oxygen around your blood, proteins do it all. And just like man-made machines, proteins have to be precisely built if they are to do their jobs. A small part out of place, whether a nut in a car left loose by an errant mechanic, or an atom in a protein mutated by UV light, can cause the whole mechanism to fail. Sometimes this will have disastrous consequences: a failed brake in your vehicle, or cancerous cells in your body. You don’t have to be interested in biochemistry and its implications to appreciate that proteins are beautiful wonders of nature, just as you can appreciate the elegant design of a car without knowing how it works. The difference is that you can see wonderfully designed cars all the time. But where could you marvel at the structure of a protein? How about Minecraft? Thanks to the work of my chemistry students and the support of the Royal Society of Chemistry, that is now possible. 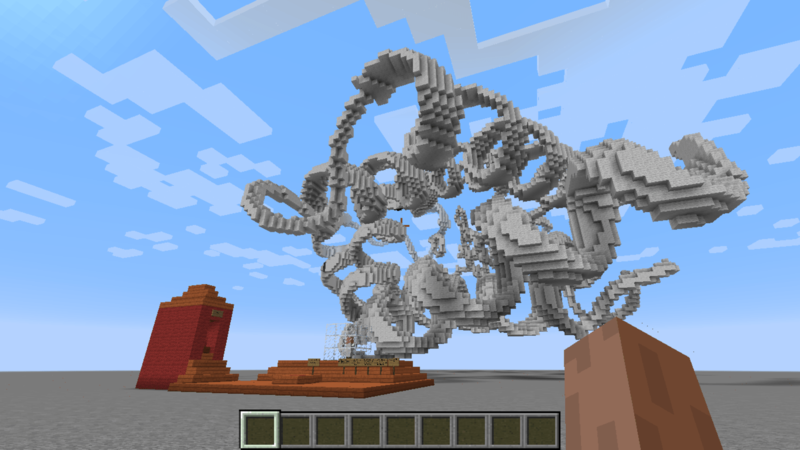 MolCraft is a world where the majestic helices of myoglobin rise above you. Where you can explore this massive molecule and its iron centre that carries oxygen around your muscles. Or, if you prefer you can fly down a pore through which water molecules normally flow across cell membranes. In MolCraft, anyone can explore the building blocks of these incredible natural nano-machines. You can discover how just 20 chemical building blocks can result in the astonishing diversity of structures and functions that are required to hold living things together. 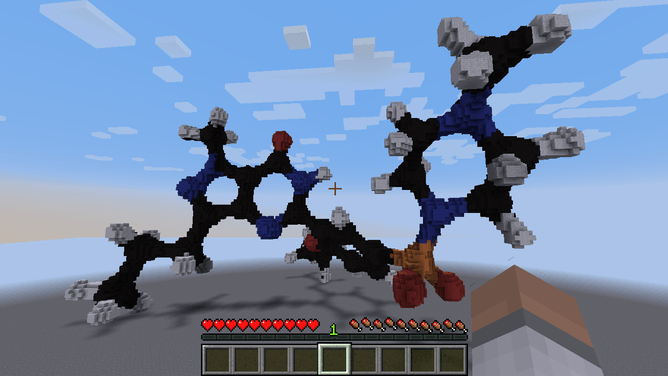 Histidine as seen in Minecraft. Histidine as seen by a chemist. There are plenty of accessible molecular visualisation tools, both physical and virtual. 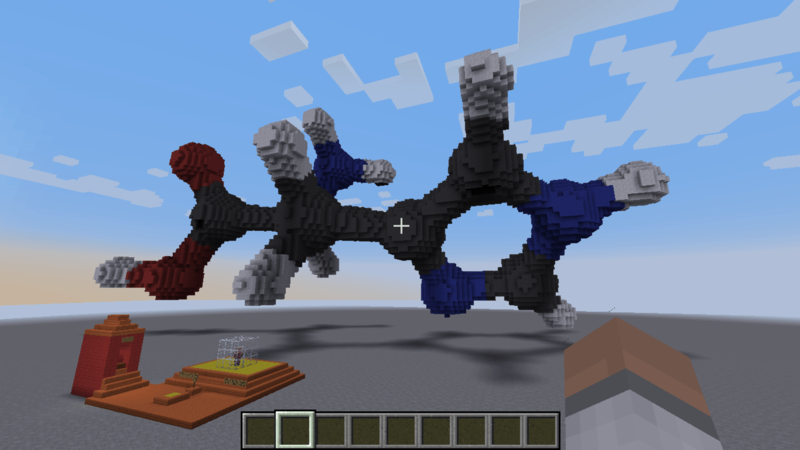 But now we’ve used Minecraft to turn the process of exploring and learning about molecules into a game. MolCraft contains a scavenger hunt, quizzes and clues dotted around the world that can be solved with the help of information found during players’ explorations. 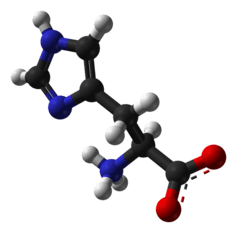 Imagine a science lesson where the class is let lose in Minecraft with instructions to find a set of objects hidden on key parts of molecules. Upon retrieving them the teacher will know which molecules each student has explored and what questions they may have answered to find the objects. All this time, the children think they have just been playing a game. As well as making MolCraft available to download for free, we’re also working on ways to further integrate the software into education. One idea is to turn it into a complete online learning environment, where students can complete coursework, write assignments, take part in quizzes or help developing other teaching resources, all within the game. Their tutors can then see their work and send them feedback while still immersed in the Minecraft world. The authors posing in front of glycine. 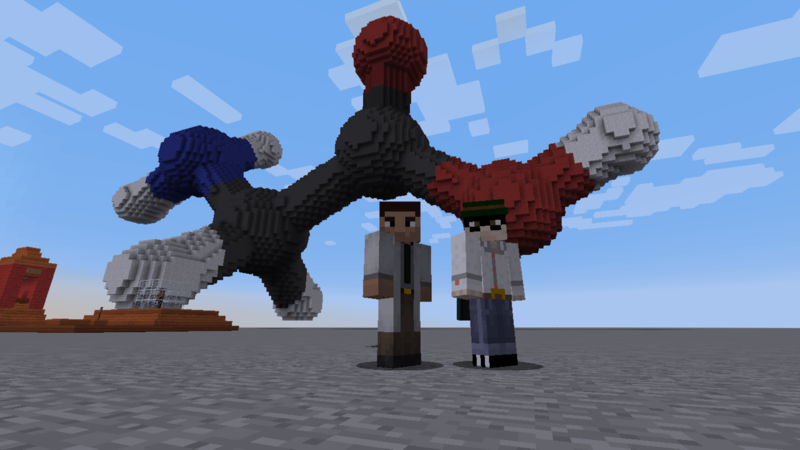 Using Minecraft for teaching doesn’t have to stop at proteins. Our other Minecraft-related projects are allowing students to explore and understand deserted medieval villages or reconstruct the architecture of Hull and there’s much more in the pipeline. The only limits are the imagination of teachers and students.